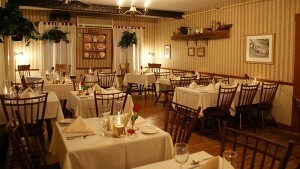 A quintessential Vermont Inn dining experience – located in the heart of the lakes region. 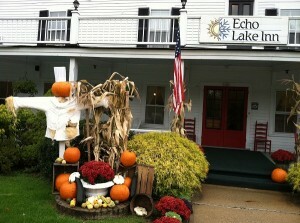 The Echo Lake Inn was built in 1840 as a Victorian summer hotel. 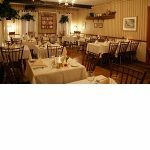 Today it remains one of the few authentic Vermont country inns operating year round and is a wonderful stop for a memorable group meal. The Inn’s rich heritage includes frequent visits by President Calvin Coolidge, Henry Ford, Thomas Edison and many other historic figures. The restaurant, recently featured in both Gourmet and Bon Appetit magazines, is well known for the excellent food and service provided by Chef Phil Lewis and his staff. Enjoy one of our perennial favorites such as the roasted duck or grilled sirloin, or a group lunch tailored just for you, on our front porch or beautiful dining room. Don’t forget to leave room for our homemade desserts. 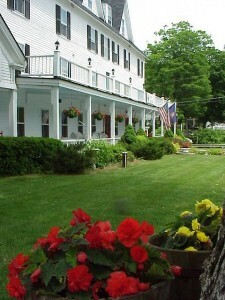 The Inn offers fine Vermont lodging plus a swimming pool, tennis, oversized Jacuzzi and a dock on Echo Lake with canoes and row boats. 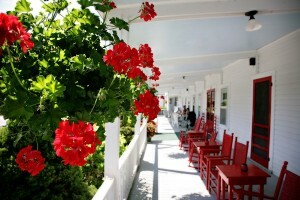 Located just minutes from Okemo, Jackson Gore Inn and Castle Hill Resort/The Pointe Hotel and on way to and from The Vermont Country Store or President Calvin Coolidge Historic Site. Group menus available. Reservations required. Plenty of motorcoach parking.